This morning I was sitting out on my balcony, staring at a new print of a Monet painting that I recently picked up. 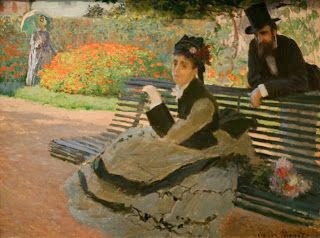 Lady on Bench in Garden with Man behind Her. Amidst swirling memories from a night spent mixing and matching unsettling, disturbing ideas, thoughts and possibilities in my head, I allowed myself to get lost. Wander around in the potential for adventure and new possibilities that the unknown often brings. How? Why? Can all this come to pass from a picture of strangers? Because paintings offer a glimpse into untapped potential. They back-light a vast number of possibilities of who the person (or people) in the painting are? What they're doing? Why they're doing it? How deeply motivated is the woman dressed in black, sitting on the bench, looking forlorn? Did she sit down, unable to grieve any longer, following a funeral? Is she just lazy? Maybe she's consistently unhappy? Why? In my newest Monet painting, beautiful flowers in a large garden stare back at me. I can't help but wonder, why? If you're feeling down or sad or wearied or simply plain old dissatisfied with life (the lady on the bench), why would you choose NOT to look at the beautiful flowers right next to you? Why, instead, intentionally look away from all that comforting beauty? Now, like I said, this post is about finding hope and inspiration when darkness overwhelms you. Be aware that shifting your perception(s) takes effort on your part. Like staring at a painting. Contemplating it. Letting your mind roam into the colors of the images. Soar over and down the curves and backsides of their unseen, metaphorical rainbows. Their implied emotional thunder clouds. In spite of the fact, that you have zero idea or indication of what's there? What you will find? Paintings hold promise. Take a few minutes today and try to find one that you can mentally ambush. Get lost in it. Liberate yourself with its gorgeous, unfettered landscape. Capture the essence of its people and carry them with you, creating new memories, forcing out the dark, nightmarish moments locked in your head. Hold the hope of the unknown tight to your heart, careful not to suffocate it with your intense, mindful grip. Bury those psychological demons claiming life can't be better than it presently is. Take a chance. Risk proportionately. Respect your right to have a bad day or moments or memories, even when you don't deserve it. And trust yourself enough that even if you awaken tomorrow after another round of unsavory thoughts or ideas, that you can handle it. Find a way to move on.